Here are some ideas for preschool math and science centers about birds. For an easy math center laminate ten bird nest shapes, each with a number from one to ten written on it. Then provide jellybeans to use as egg counters and have the students place the correct number of “eggs” on each nest. This is great activity to practice counting groups of objects up to ten. Place feathers, eggs or eggshells and bird nests in your science center along with hand lenses for your students to use for observing the objects. Laminate pictures of birds and put them into a center. Students can sort them by color, size and other traits. They can also put pictures of birds in order from smallest to largest. These fun preschool crafts ideas are fun to do when your preschoolers are learning about birds. Students can make easy bird paper bag puppets. Give each student a brown paper bag, two large wiggly eyes, a yellow or orange triangle, and some craft feathers. Show them how to glue the eyes on the bag and then add the triangle to make a beak. They can then decorate their birds with the feathers, gluing some on the top of the bird’s head and some on the sides of the bag like wings. Students can use feathers instead of paintbrushes to paint pictures. 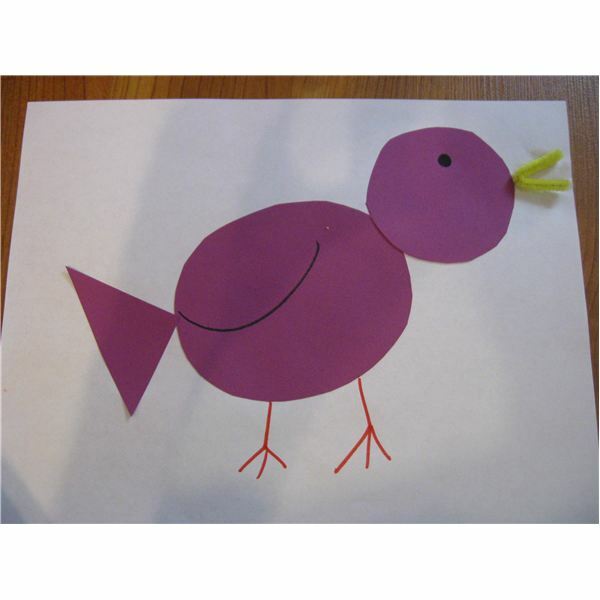 Preschoolers can make a simple shape bird out of colored construction paper. Give each student an oval for the body, a circle for the head and a triangle for the tail. Show them how to glue the shapes onto a piece of paper to make a bird. Then they can draw on an eye, a beak, legs and a large curve on the oval to make a wing. Also provide wiggle eyes or beads for the eye and a small piece of pipe cleaner folded in half for the beak. This makes a cute bird and is a great shape review, too! Teach your students how to make a bird nest with play dough and outdoor objects that they collect. Kevin Henkes describes birds and their different features through the eyes of a young girl. Preschool students will be enthralled by the little girl’s observations and thoughts about birds. This is a fun book for introducing your bird unit. This is a perfect choice to introduce young children to birds, their habits and their habitats. It contains simple information along with lifelike watercolor illustrations that portray birds in their natural environments. It’s a great guide for beginning birdwatchers. You might even be able to take your students on a walk around the school and use it to identify some birds. Preschoolers will get a kick out of this rhyming story about an emu who is tired of his boring life at the zoo. He decides to try out being another animal. After spending time swimming with seals, slithering with snakes and trying out other animals he decides that being an emu isn’t so bad after all. Young children will also enjoy the sequel Edwina the Emu. Students can practice counting backwards as ten colorful eggs hatch into birds one by one in this fun, rhyming counting book. Give students jellybeans or plastic eggs to use as counters and let them count along with you. After reading the story you can also give each student an egg shape to decorate.